After Manish Malhotra, I feel that the other person who makes the best bridal lehengas is Sabyasachi Mukherjee. He pays so much attention to colors, intricate embroidery and hand-picking different materials, that any bride would feel pampered by him! 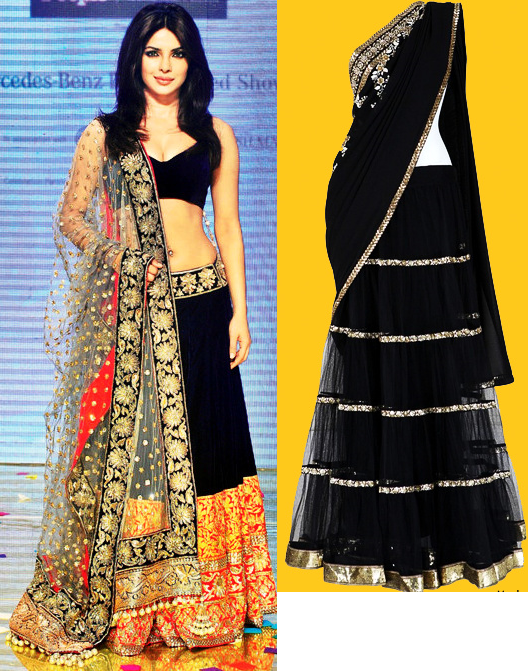 Below are some of his best work that can give brides tons of ideas in choosing their lehenga this wedding season. It’s YOUR big day. That clearly means that you need to look the best! Plan the outfits much in advance so that you can inform everyone else (sisters, cousins) about the shade that you’d be wearing so that no one else wears a similar color combination. If you have certain apprehension of the hairstyle suggested by the hairstylist, don’t feel shy in letting him/her know. After all you are the one who’s getting married. Also, if you feel the makeup looks too heavy, inform the makeup artist. Take care of your feet much before the wedding and stay away from heels as much as you can prior to the functions. In case you have to dance, carry a pair of flats so that you don’t land up with a sprain and have fun too! At the time of the reception, you’ll be standing for a minimum of 3 hours! Swap the stilettos for flats in between for at least 30 mins to give some relief to your feet. No one will notice since the feet will be covered by the length of the lehenga or sari. awesome compilation…loved all the pieces! Thank you for appreciating. I also love all of them 🙂 Sabyasachi has a magical quality in his work. Hi Sabnam – Glad you liked it. Thanks for visiting Zuri. Very glad you liked this post. Best wishes. love all of them….i admire sabyasachi..